Antiparasitic Frontline Combo Dog. Frontiline Combo Dog is a new treatment that eliminates external parasites in a holistic manner, very efficient and totally secure. The preventive and curative treatment is very easy to implement. This product eliminates adult fleas and prevents these for 1 month, removes and prevents ticks during these 2 weeks and kills lice nuances. It also prevents the development of eggs, larvae and pupae of fleas for 1 month and a half. 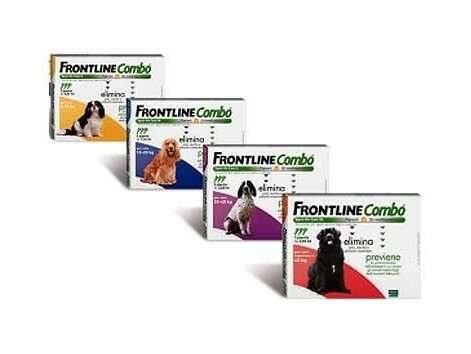 Frontline Combo is disseminated throughout the body of the dog in less than 24 hours. Can be administered to pregnant or lactating females. The only contraindication is that this product is that it should not be used in puppies under 8 weeks and / or weighing less than 2 kg If the dog lick the product will produce a brief period of hypersalivation without any higher. This will happen quickly. The dog should not swim in during the two days following the treatment. The INSTRUCTIONS FOR USE for this product is: 1 Keeping the pipette right. 2 Give a flick at the close of the pipette to ensure that all content remains within the main body of the pipette. 3 Break the tip of the pipette. 4 Separate the hair on the back of the animal at the base of the neck, in front of the shoulder blades until the skin is visible. 5 Place the tip of the pipette on the skin and squeeze the pipette several times to empty its entire contents directly onto the skin in one spot. 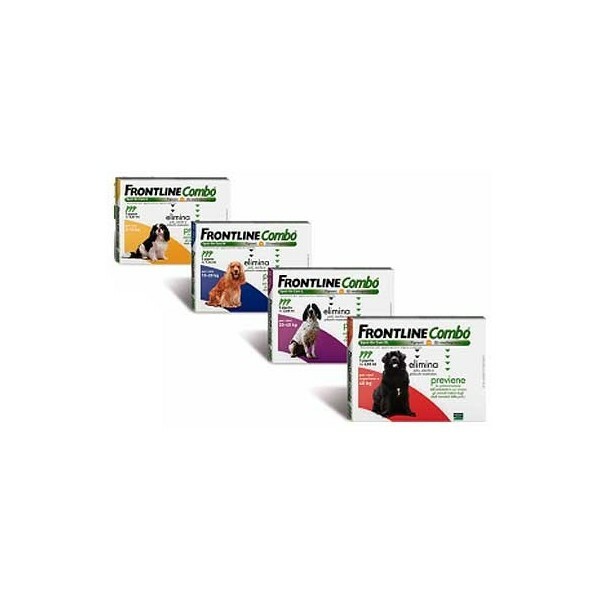 TYPES: Frontline Combo 2 to 10 kg in weight. Box of 3 pipettes of 0.67 ml. Frontline Combo 10 to 20 kg in weight. Box of 3 pipettes of 1.34 ml. Frontline Combo 20 to 40 kg in weight. Box of 3 pipettes of 2.68 ml. Frontline Combo over 40 kg of weight. Box of 3 pipettes of 4.02 ml.